Announcement NOTICE: Taking a break to create new work! I will stop taking new orders in my shop for two months. I will re-open for new orders on April 30. About my shop: I make jewelry that's a little different. Contemporary, yet somehow as old as the universe. Organic and full of texture but never overwrought, my designs are tightly edited until they're just perfect. Streamlined, modern, yet organic and found somewhere in the depths of our collective human memory. Made of recycled metals and ethically sourced stones including ones provided by clients for their sentimental nature. Created by one goldsmith from start to finish. My pieces look ancient, historical, inspired by natural textures and objects with an industrial, antique or wabi-sabi feel. Made with a planned imperfection but engineered to be comfortable, sturdy and last a lifetime or more. Modern heirlooms for the highly original human. Each piece is made especially for you when you order. I design, sculpt, cast and finish all pieces myself and I set the stones by hand. Custom orders using your stones and gold are welcomed! Please allow 6-8 weeks for delivery of a custom made piece of jewelry. Rush orders are sometimes possible but may incur a 20% rush charge. Most items are CUSTOM made so PLEASE take a look at my PROFILE for info on sizing, gemstones, techniques, production time, downpayment policies etc. I take special requests for stones and customization of designs. I may be able to use your old gold jewelry to make you one of my cast rings starting at $180. NOTICE: Taking a break to create new work! I will stop taking new orders in my shop for two months. I will re-open for new orders on April 30. Another wonderful ring! Thank you so very much! And a pleasure to custom. Gold rings, freshly cast. More steps to go! Rustic, ancient, nature-inspired, organic. Artisan designed jewelry inspired by ancient relics, futuristic post-apocalyptic worlds, vampires, fairies and long-forgotten magic and wisdom from a distant time. Using traditional goldsmithing techniques I create bespoke fine jewelry in the USA. I am a full time Professor of Marine Biology with a minor in geology. Fossils and crystals were what set me on my career path in science. Ancient worlds and magical processes that produced these remnants of a time lost to history. Unearthed artifacts of civilizations that vanished leaving mysteries of how they were made; the artistic inspiration of an early people. These things intrigue and inspire us. We struggle to be happy in a modern world and yet the tug of our hidden path through history seems to shout out from our DNA. My work, in reflecting these ancient patterns, artistic styles and ancient goldsmithing processes does much to satisfy this missing, organic, wrought by hand, spiritual, symbolic and intimate need. If you find my work appealing and intriguing then I have succeeded in connecting to this in you. 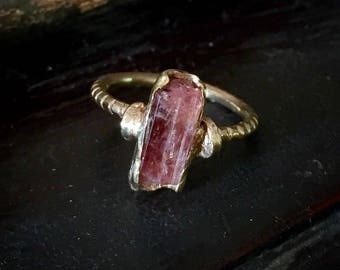 Made of recycled gold and silver, I produce all of my work myself from start to finish using only traditional and ancient techniques such as lost wax casting, hand forming, forging, finishing and stone setting. Each piece is created individually and clearly shows the maker's hand. My pieces may have a vintage or indeed, ancient, look but they are engineered to work in a modern, practical way combining with contemporary styles and working for a busy and active lifestyle. I answer to an ancient call but we live in a modern world. I make jewelry that's a little different. Contemporary, yet somehow as old as the universe. Organic and full of texture but never overwrought, my designs are tightly edited until they're just perfect. Streamlined, modern, yet organic and found somewhere in the depths of our collective human memory. When I was growing up I wanted to be an Astronaut or a Fashion Designer. Kids, right? Well, turns out I became a Marine Biologist and a Jewelry Designer instead. Creativity, logic, left, right. I say it's all because a lopsided brain is a bad thing! I accept returns on items within 7 days. I will NOT take any returns on customized items. I do not refund shipping costs on any item. Please ship with tracking number and insurance. I can not be responsible for items lost in the mail. Item can be exchanged and shipping of exchange item will be charged to the customer. I can not usually exchange a ring if it is the wrong size as I don't always have all sizes available. Please check your size carefully. This is best done at a jewelry store but you can do it at home. Here is a one link. You may return item for resizing. I can usually go up a half size on rings. This may not be possible on some items. I can not size down rings with stones. The customer is responsible for re-shipping and there may be a charge for sizing or re-making item. Please be SURE of your size. Wide rings will be sized up 1/4 to 1/2 size for comfort. I require a non-refundable order charge of 50% of the item price on custom items. Custom items are NOT RETURNABLE for any reason. A deposit will be required before any extensive design process begins (after 2 inquiries or first set of pictures is sent). Photos of stones and waxes will happily be provided before/while piece is being created so that client understands what is being created. Fees will be charged for changes made to design after final design is agreed upon by client. Changes can be made only through wax stage of cast pieces. Once piece is cast/formed changes can no longer be made. Some custom items will be more expensive than listed item as materials may cost more and there may be additional labor. Please convo me for custom orders quotes. Please keep in mind that stones are individual and so is the process so no item can be guaranteed to look exactly the same as one listed. However, they are made to be as close as possible and made with stones and workmanship of the same or better quality. I try to make sure my customers will be happy with their order so PLEASE ask any questions about items first as custom items are NOT RETURNABLE. If faulty or broken I will repair or exchange ONLY. I gladly ship internationally but please note that the customer is responsible for any taxes or customs fees when ordering internationally. Depending on your country USPS insured may not be available. Shipping costs may be high for Insured Fed Ex and you will be charged any difference accordingly. Customs declaration amount must match insured amount. GOLD RECYCLING PROGRAM: Prices for work will be based on labor and the value of your gold. I can only accept Gold of 14k or higher and NO fine chain as it can not be used for casting new items. STONES: I can use stones provided by the customer but can not guarantee against breakage in removal of stones or in setting as it sometimes happens with damaged or brittle stones. Providing them is at the customer's risk and no compensation for broken stones can be provided. MATERIALS PROVIDED BY CLIENT: Materials provided by client can not be guaranteed as authentic or appraised by PhBeads (Wax & Stone). Metals not marked with fineness marks will be tested for fineness (14k, 10k). Materials not suitable for use in pieces to be produced will be returned to client if requested. Any materials provided by client will be forfeited by client to PhBeads (Wax & Stone) in liew of payment for services if finished pieces/work have not been paid for at the end of 6 months after completion of order. RUSH ORDERS: Pieces MAY be able to be made on a shorter time frame than stated in policy but a schedule disruption fee of $40 will apply.